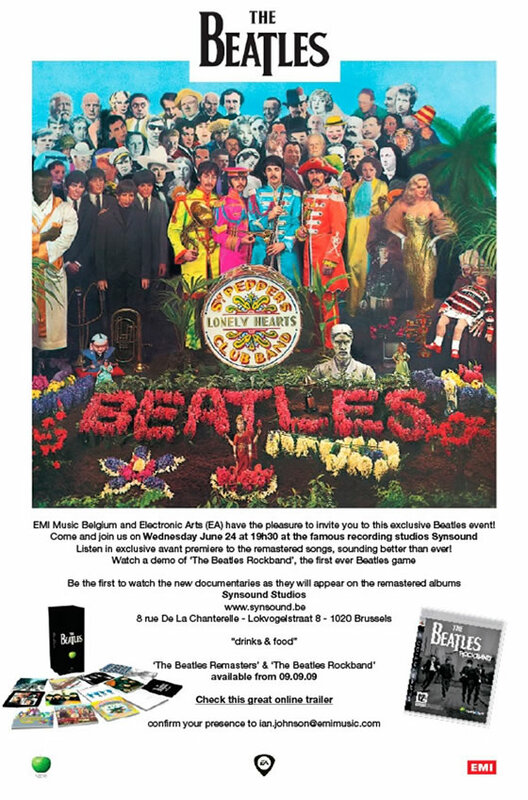 June 2009 : The Beatles Remastered : EMI Belgium chooses Synsound Studio and La Brasserie for the presentation of the reissue of all Beatles classic albums and of "The Beatles Rockband" game, to be released on September 9, 2009 ! June 2009 : The Beatles Remastered : EMI Belgium chooses Synsound Studio and La Brasserie for the presentation of the reissue of all Beatles classic albums and of "The Beatles Rockband" game, to be released on September 9, 2009! December 2006 : DVD mixing, Sioen : new track recording and mixing in studio II. With Dan. Charline Rose rehearses her new concert in la Brasserie. choir recording in la Brasserie for his new album, Daan : tracks mixing for his new album. Engineer : Dan. Janu rehearses her new concert in la Brasserie. August 2006 : Back from Spain, Dan starts mixing tracks in 5.1 surround sound for Helmut Lotti's DVD in the SSL studio. Dan mixes also some other artists like Jean Bosco Safari and Frederic Lamory. June 2006 : Helmut Lotti : stereo mixing by Dan. Some other artists also come to mix with Dan : Slick, Palmbeach, and the recently refomed Belgian band Polaris. April 2006 : Elektrokid mixes tracks in studio II, Sttellla records the "big choir" for his new album in la Brasserie and studio II, Helmut Lotti starts recording new tracks for his new double album... all engineered by Dan. And about the SSL console, it is deeply serviced by a chief technician engineer coming especially from the SSL factory for 2 days, on the 7 and 8 december. November 2005 : La Brasserie : showcase of successful French artist Cali in front of 200 fans and press people. Recorded by Dan in Studio II. October 2005 : Ba Cissoko records his new album in studio III, while Helmut Lotti records 7 tracks for his new forthcoming album in studio II with Dan engineering, using again la Brasserie for strings overdubs. La Brasserie also echoed with the chords of French singer Ben Ricour, who made a fantastic private showcase for press people and fans. September 2005 : Daniel Powter rehearses his new show. Engineer : Hassan Chaïdi. July 2005 : recording and mixing of Charline Rose's new album. Songs are from Fred Momont and Jacques Duvall. Engineer : Dan Lacksman. To be continued in August. June 2005 : mixing of "Eenzaam zonder jou", a musical based on Will Tura's songs. Producer : Jean Kluger, engineers : Cooky Cue and Dan Lacksman. mixing of Telex new album, to be released in January 2006. Producer : Telex (Marc Moulin, Michel Moers, Dan Lacksman), engineer : Dan Lacksman. recordind and mixing of Helmut Lotti's new version of "Vergeet Barbara", a Will Tura classic. French superstar Pascal Obispo inaugurates "La Brasserie" with a private concert for the release of his new double album, "Live fan - Studio fan". Sony Music Belgium has booked the new venue for a private showcase, given in front of some 150 people, some of them being lucky fans, winners of a contest, and the Belgian medias - the Belgian main TVs, radios and newspapers. "La Brasserie" being linked to the SSL studio, the concert has been mixed in stereo for the TVs and the radios, but also recorded in multitrack onto Pro Tools HD. November 2003 - NEW ! SYNSOUND STUDIOS OPEN 2 NEW FACILITIES! On top of the already successful SSL room (Studio II), Synsound Studios open up a brand new digital studio (Studio III), with "good pricing, but top quality", and studio-owner Dan Lacksman opens up a dedicated synthesizer-room, "The Synthroom"
This studio is based around a SONY DMX-R 100 desk and a Pro Tools 24 Mix + with all plugins. A large recording room with daylight and top quality acoustics, designed by Dan Lacksman, offers you the possibility to do quality recordings of drums, vocals and all acoustic instruments. This room also features the possibility to transfer your multitrack tapes onto Pro Tools (before they become unreadable ! ), from ADAT or DA-80 8 trk, 24 trk analog or digital, 32 tr digital and 48 trk digital multitrack formats. Is a heaven for musicians who appreciate vintage and new keyboard-sounds. From modular Moog to soft-synths it's all ready to go. Just like the Digital Studio, the Synthroom is based around a digital SONY DMX-R100 desk and a Pro Tools system with Mister Lacksman tweaking the knobs...what can you possibly want more? MORE DETAILS SOON, INCLUDING EQUIPMENT LIST. Marie and Dan Lacksman, owners - Luc Van Acker, booking manager. January 2003 - NEW ! Pro Tools HD 48 channels ! see more details in our equipment list ! August 2002 - David Bowie chooses Synsound for mixing his Paris live concert!